Looks like there could be a big score today! I was offered a ticket to this, glad I declined and am in sunny Suffolk instead! See from the team sheet Chris Gale isn't in the Windies side. England will be glad of that. Any chance of any play ? I could see Stokes coming in if the openers fall early, just to capitilise on the in field. Also, I had someone arguing with me about Jony not being good enough for ODIs and yet his career avg is 45, sr 90 and his stats this year read century, 3 50s, an avg of well oevr a 100 and a sr of well over 90. Sprained a fetlock apparently. Got no time for the geezer myself. The sooner the WIndies pension him off, the better. Can't bat, cant bowl, can't field. Just a mediocre imitation of KP and I wouldn't rate him in my top 10 ODI team. sans, were you born yesterday? The day before perhaps. Bairstow is 10 zillion times better a bat than Jason Roy, Jos Buttler. The guy who ever encouraged Bairstow to keep wicket should be whipped naked through the streets of York! His keeping this summer has been superb however. He is better than Buttler. There is no advantage to be gained in playing Buttler ahead of Bairstow in any format of the game. England have had no issue whatsoever scoring big runs and Root's strike rate is a perfectly adequate (for a #3) 86.51. Willey has shown little aptitude with the bat in international cricket, he struggles with the short ball and I suspect he would end up scoring more slowly than Root. Imagine that; a one dayer in the latter half of September in England gets rained out. In England rain can strike at any time. No pattern to it. So we shouldn't strive to be better? Our record during the powerplay isn't actually very good for a team who's been scoring a lot of runs, sure it's how many you get not how you get them at the end of the day but we could do better and that seems the obvious area that we could improve. It's not adequate for someone coming in during in early during the powerplay overs. England have it right asking their openers to go for it straight away but confusingly wrong by sending Root in next, it doesn't suit Roots game or how we should be batting during the powerplay. I want Root coming in as soon as a wicket falls after the powerplay (or in the last over of it I guess) when he can use his class to rotate the strike and score boundaries along the ground once the field is out. I only really mention Willey because the England management seem to be intent on playing him and he does it for his county (he also looks pretty darn poor late in the order in contrast to say Plunkett). I'd have no problem with Bairstow at 3 and having Roy or Billings opening with Hales and dropping a bowler (presumably Willey). The other option would be to send Stokes or Buttler up the order but they've been central to us scoring a huge amount of runs in the last 15 overs so I'd rather we didn't tinker with that. Yeah rain in England isn't really seasonal we get it all year round with little seasonal variation and I'm not going to argue with us playing or at least trying to play more cricket! Slight issue for match going spectators with the temperature in certain parts this time of year though! Of course not but the idea of replacing one of our greatest ODI batsmen ever with David Willey is, frankly, risible. I was under the impression England were one of the best performing teams in the first 10 overs since the last World Cup. Is that not the case? Where are you getting your data from? So you think Root should be batting the majority of the powerplay overs then? I'm not talking about kicking Root out of the team just moving him out of the first 10 (or 6 in T20). You don't find it strange to tell our openers to go from the off and then when one of the falls early bring in Root despite us having plenty of batsman who like hitting over the top? We're mid table from what they've shown on sky during the CT, I can't seem to replicate the figures from cricinfo but maybe that's just me (can't find an option to limit by overs). The stats are always going to be skewed though as any team you'd have thought would do better when their openers are still in after 10 overs (over a spread of 50 games+) the way the game is played now. Other than a couple of times where both Hales and Roy have both got going and kept going for a while most of our improvement in runs has come from us being the best team in the last 10 to 15 overs, I doubt that would change by having Root come in after the first power play. Gorgeous day in N. London today. Looking forward to it. Hope it lasts until tomorrow. Never understood why they don't play these ODIs over 5 consecutive days. Impractical in most countries, I know . In England though, why not? 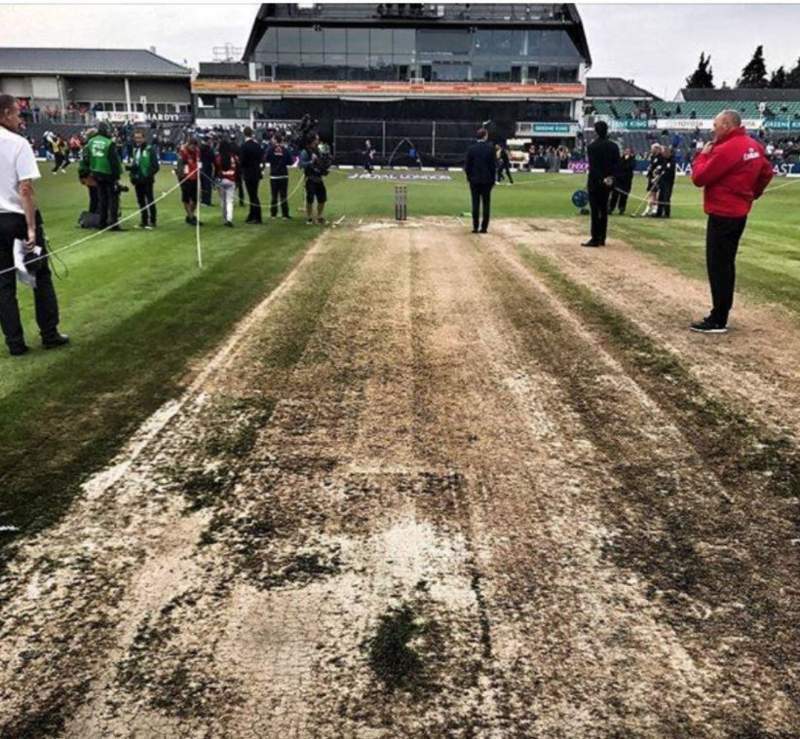 Not sure about the way this wicket looks! 24c here in sunny Norfolk. Looks good in Bristol too for last of the summer run fest.